Like Horisont, this was another one of those releases in which I had heard some trusted sources raving about it and gave it a shot. I heard the stream of "Whispering World" and fell in love. Not to take away from the rest of the band but bassist/vocalist Mlny Parsonz is the real star here. She has such an incredibly powerful and dynamic voice. It can be soft and sweet, or raspy and edgy. I could definitely see her becoming a role model for a new generation of young girls who want to rock hard (My girls like Royal Thunder anyway. And Witch Mountain. Uta Plotkin has some stellar pipes too.). 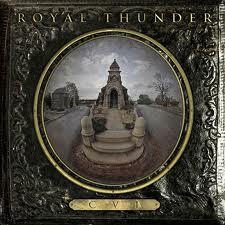 Royal Thunder isn't just about that voice though. CVI is loaded with instantly memorable songs with massive hooks, southern groove and a whole lotta soul. Royal Thunder have something special going on here. Let's hope they get even better. Man, I really should have gone out to see them when they rolled through Ontario with CoC.